SHEILA: Tell us about your journey to rock? How and where did it begin? DAVINA: I grew up in a suburb of Philadelphia. As a kid, I discovered my mother’s strange collection of albums: Aretha Franklin, Kenny Rodgers, Barbra Streisand, Led Zeppelin, Captain & Tennille. Lots of totally unrelated artists. It was the 70s, I was in elementary school, and disco/funk was the thing at the time. Donna Summer’s “Live and More” was the very first album I ever bought. I would sit and listen to it for hours, every day, singing at the top of my lungs. Then I’d do the same with “Led Zeppelin II”. By the time I was 12, I owned every Led Zep album. So, I’ve always loved to dance and sing to disco/funk tunes, and at the same time, I loved to headbang and sing to rock tunes. Though my dream – like many teenagers – was to sing in a rock band, I was terrified to sing on stage. It wasn’t until adulthood that I finally took the plunge to do music, and wound up in a disco/classic r&b cover band. Though I enjoyed it, after a while, my heart wasn’t in it. My suggestions to add certain rock songs to our repertoire were met with firm dissent. Eventually, I just decided to go solo and do original material, and in my head, the arrangements to my lyrics were rock arrangements. Fortunately I met rock musicians who understood what I was trying to do, and that was that. Rock was always in my heart, but it took me a while to get over myself (the color thing) and have the courage to do what I really wanted to do. I’m a late bloomer with everything. SHEILA: How do you could characterize your sound? 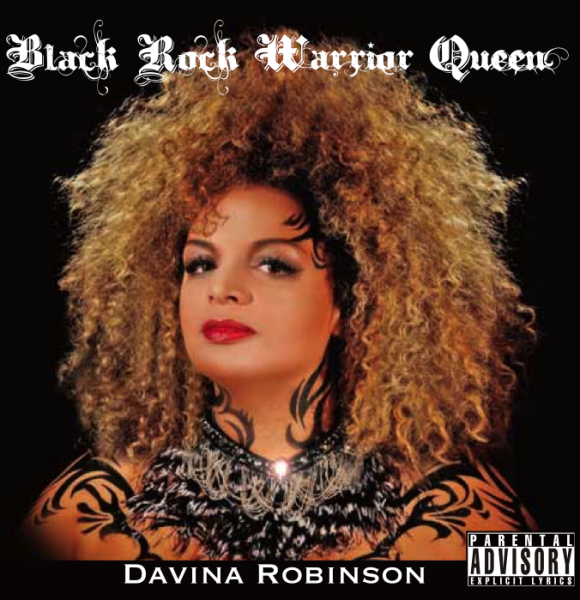 DAVINA: “Powerhouse Rock n’ Roll Soul” is the tag line I’ve used since the release of my first CD, “The Blazing Heart”. A couple of songs were throwbacks to 70s funk-rock. The producer/arranger/guitarist on that album was a 70s hybrid rock kind of guy. And I think it’s a good description for that particular album. The producer/arranger/guitarist for the second album is definitely influenced by 80s hair metal, while my vocal style is influenced by 60s & 70s classic rock/funk rock. So how about “Hybrid Funk Rock with a Dash of Hair Metal.” LOL. I feel like my sound is still evolving, so we’ll see how I’ll describe my sound with the next release. SHEILA: Of your most recent release, “Black Rock Warrior Queen” reviewers say “it sounds like you’ve been liberated.” Is that the case? DAVINA: Liberated? Hmmm… Mostly yes and little bit of no. Most of the songs were written within the 6 months or so before recording started. But a few were written years ago, and probably should have been on my first album. So there is a lingering of a former style on “Black Rock Warrior Queen”. But I think this recent album has been liberating in that I found the right guitarist/arranger, who knows how I sing, and tailored his arrangements to suit my lyrics and singing style. Also liberating because this album is more consistent in its sound/style, whereas the last one was like a compilation of different styles. For my guitarist, it was his first time to produce a whole album. And it was my first time to be in charge of a whole project. So we both learned a lot from the “Black Rock…” experience, and for the next album we’ll take that knowledge and create something even better. In about five years’ time, having come out with more material, I think I’ll probably look back at “Black Rock…” as a transitional piece. The themes of the songs on “Black Rock…” vary, but to me the common thread is that most of the songs are analyzing or looking back and saying goodbye to someone or some thing. So in that aspect too, I think “Black Rock…” was liberating. All those pent-up feelings were finally released through songs like “Monster”, “I’m the One Who Dumped You” and “These Tears.” I can’t predict what kinds of songs will go on the next album, but I know the general direction will be looking forward, not looking back. And that’s where my life is right now; I got those feelings out of my system and now it’s time to move on. Less tears, more humor (like in the song “Faking It”), more sass (like in the song “Funky Chick”). 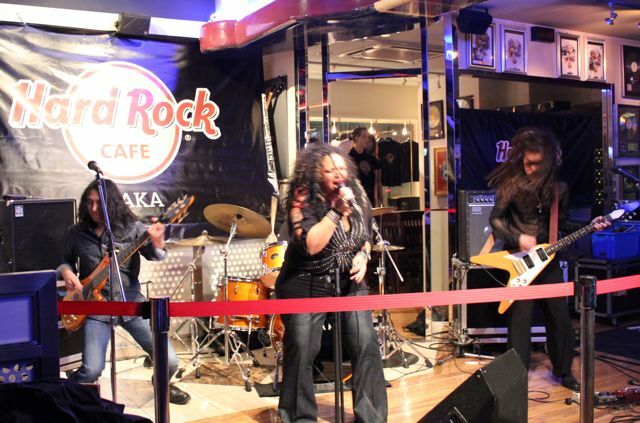 SHEILA: What is it like to be a ‘Black Rock Warrior Queen’ in Osaka Japan? DAVINA: At times it’s great, other times it’s quite lonely. But I guess that’s how most indie musicians feel, anywhere they’re based. I definitely stand out, so I’m memorable, I think. But there are cultural factors that are probably a hindrance; one is singing in English. That doesn’t seem to be a problem in Tokyo, but Osaka is not as internationalized as Tokyo. I can speak Japanese relatively well, but writing Japanese lyrics is a bit difficult. Another hindrance is stereotypes, just like in the US. Everyone assumes I sing R&B. The rock scene here is mostly all young & male, very high energy, lots of tempo changes and is aggressive. In comparison, what I do is considered Adult-Oriented Rock here. The veteran rock musicians here seem to move into blues-rock or jazz-rock. Any female rock musicians (very few!) I’ve met are really young and do either a gothic style or a cutesy power-pop style. So that sort of leaves me in a no-man’s land, as far as bands to pair up with for gigs. I recently met a young music student who didn’t know who Led Zeppelin was. This seems to indicate that Classic Rock has been relegated to niche status. A generational thing. But in general, the audiences are receptive, and seem to like my music and my voice. But in order to attract more Japanese fans – if I continue to sing exclusively in English – I’ll have to write more songs similar to “Osaka Boys” (from “Black Rock Warrior Queen”), with fast tempos and easy-to-understand lyrics, or “Behind Closed Doors” (also from “Black Rock…”) where the lyrics are not fully understood, but there is a lot of emotionality and vocal gymnastics. 🙂 I have to find a way to coordinate my artistic preferences with that reality. And that is the central theme of any musician’s career, right? SHEILA: I ask this question of everyone, because I am tallying the numbers. 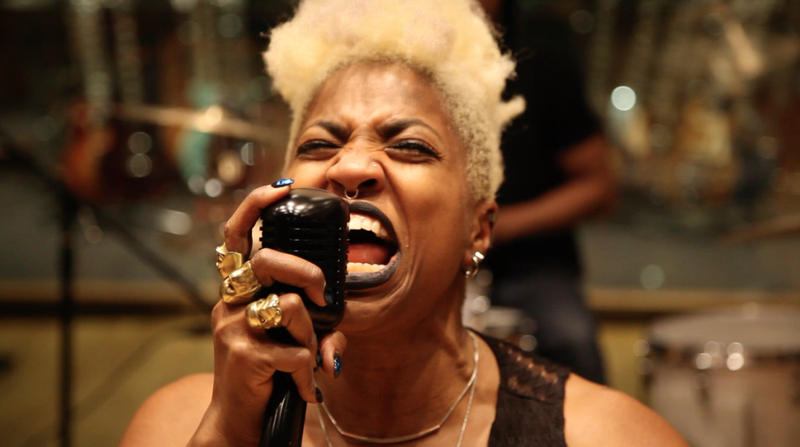 How many black women in rock do you believe there are? DAVINA: I’m sure there are plenty, but they’re not in the limelight, so it’s hard to come up with an actual number. Are we talking rock like Straight Line Stitch and Audioslave or hybrid rock like Mother’s Finest and Lenny Kravitz? I find a lot of indie musicians, like on ReverbNation, put “rock” as one of their genres. Getting back to your question. I’ll assume currently active, straight rock and hybrid rock, and living worldwide, so I’ll say in the thousands, maybe 3,000. Always think positively. SHEILA: Where to find Davina’s music….